PORT LOUIS, Aug 9 2012 (IPS) - “Look out there, the blue one…. 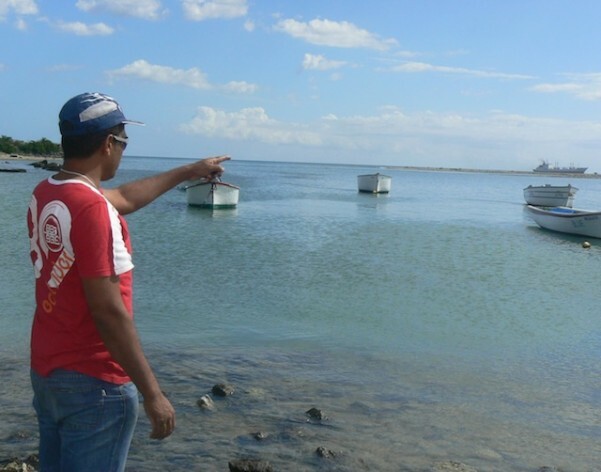 that is a European Union fishing vessel that is threatening our livelihood,” says Lallmamode Mohamedally, a Mauritian fisherman, as he points to a boat offloading its catch at the Les Salines port, close to the country’s capital Port Louis. He is one of the fishers who have returned after a hard day at sea with their boats almost empty. Pollution and tourist activity have reduced the fish catch on the island’s lagoons over the past few years. But local fishers say a February agreement between the EU and this Indian Ocean island nation, which allows European vessels to catch 5,500 tonnes of fish a year for three years at a cost of 660,000 euros annually, has made the situation worse. While there are no official figures to confirm this, the 3,500 local fishers, who now have to compete with modern industrialised fishing boats, say that their catch has gone down by 50 to 60 percent. And the Les Salines fishers believe that the 86 vessels from companies based in the EU, which are fishing in the area, are stealing their livelihoods. “These big vessels are scratching the sea around Mauritius and taking away all the fish,” says Mohamedally. “Only longliners please. No seines. Those vessels catch all types of fish, small and big alike,” he says. Long line fishing is a commercial technique that uses hundreds or sometimes thousands of baited hooks, which hang from a single line. This type of fishing commonly targets swordfish, tuna, halibut, and sablefish. Seines use surrounding nets. However, Mauritian authorities believe that this is the only way to exploit its vast exclusive economic zone or EEZ of 2.3 million square kilometres. Local fishing companies here are small and do not have the ability to fish on such a large scale. The 5,500 tonnes of fish that Mauritius has allowed the EU to catch each year is in stark contrast to the few tonnes the 34 fishermen of Les Salines catch in a year. Currently the fisheries sector in Mauritius represents only one percent of the country’s GDP, and the local fish production is only 5,100 tonnes. Mohamedally says that in the past fish were abundant three to four nautical miles from the coast. Today, the fishers travel almost 15 nautical miles out to sea, but many still come back without a catch. “What will happen in five years time to our jobs? They are giving us an egg and taking an ox out of our sea,” adds Mohamedally, referring to the 660,000 euros annually that Mauritius has agreed in payment by the EU in exchange for fishing rights in its EEZ. Judex Rampol, chairman of the Syndicat des Pêcheurs, a fishers’ association, is furious about this. “This is peanuts,” he tells IPS. If local fisherfolk had the capacity to fish so far out at sea, they would earn about 15 million euros for the 5,500 tonnes of fish the EU is now allowed to catch. However, Minister of Fisheries Nicolas Von-Mally believes Mauritius needs help to exploit its vast EEZ. “We have no fishing vessels. Should we depend on locals, many fishes would have long died of old age,” he says. Von-Mally adds that canning factories on the island process the tuna caught by the EU vessels. However, it is sold mainly on the European market. He adds that tuna is migratory, and if it is not caught in the Mauritian EEZ, it will swim to the zones of the neighbouring Indian Ocean islands of Seychelles and Maldives. “We’ll thus lose revenue,” he says. Bahim Khan Taher, manager of Taher Seafoods, a small local fishing company, tells IPS that he would like to exploit Mauritius’ fish stock, but he needs modern vessels, equipment and financial incentives to fish in the EEZ. “If we get some help from the government in terms of fiscal incentives, we could also go out fishing there. This would boost our seafood hub exports,” Taher says. Meanwhile, environmentalists are concerned that overfishing may deplete tuna stocks in the Indian Ocean. Mauritian oceanographer and environmental engineer Vassen Kauppaymoothoo is one of them. “The EU vessels are here because the stocks in the other oceans have collapsed. They have been overfished by vessels from Portugal, France and Spain. The only ocean where there is still some fish is the Indian Ocean,” he tells IPS, adding that 5,500 tonnes a year was overfishing and would deplete resources. He adds that while Mauritius does not have the capacity to fish its EEZ, this does not mean that they should allow foreigners to do so. He says Morocco decided to close its EEZ to foreigners in a decision to solely keep its fish stock for its local population. “There is no reason to loot my house because I do not have the means to exploit its wealth,” Kauppaymoothoo argues. But the head of the EU Delegation in Port Louis, Alessandro Mariani, tells IPS that they are helping to create jobs, not take them away. “In Mauritius alone, 5,500 jobs benefit from the tuna that is disembarked by the EU vessels,” he says. Mariani claims that there is no competition between the EU fleet and the local fishers because they operates very far away from each other. The EU vessels fish 15 nautical miles from the coast, and the locals at three nautical miles. “We are also targeting different fish species,” he says. Mariani says the EU is very sensitive about the tuna stocks in the Indian Ocean. “Our fishing efforts are guided by scientific research. The Indian Ocean Tuna Commission Scientific Committee said in October 2011 that there is no overfishing in this region,” he says. They both deny that the EU placed pressure on the Mauritian government to sign the agreement. “This is simply not true. Mauritius and the EU are partners and we always discuss things about the interest of both the EU and Mauritius,” says Mariani.